As a professional solar industry consultant, Steve Geiger is available for solar consulting, training, project planning, inspections, appraisals, or educational consulting. Please contact him for further information on how his extensive knowledge and expertise can benefit your projects. Steve has worked in construction, energy and photovoltaics (PV) being involved in the building of custom homes and startup of 5 solar installation businesses, one of them named as a Top 10 installer in Northern California, and top 50 in the nation. Now he provides professional consulting and training for construction, energy and particularly photovoltaic solar systems installers, as well as other green energy forums. 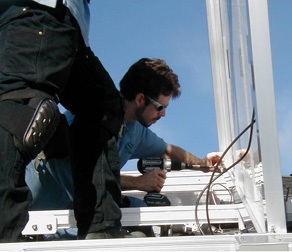 He has a broad depth of solar experience, including: leading installation jobs, supervising work crews, managing materials, and performing troubleshooting of electrical equipment and photovoltaic solar equipment. He has installed all major brands of photovoltaic panels, inverters and related power equipment. He has also trained hundreds of people. He is a corporate photovoltaics trainer, and also teaches PV for the CA Laborers Union, and California Conservation Corp. He previously was an instructor of Solar Applications & Installation at the Metropolitan Education District (MetroED) Adult Education Program in San Jose, CA - all for the NABCEP (North American Board of Certified Energy Practitioners) PV Entry Level Certificate of Knowledge. He is a NABCEP PV instructor; a BPI (Building Performance Institute) Building Analyst Professional certified energy efficiency auditor; OSHA (Occupational Safety and Health Administration) Authorized Construction Outreach Trainer; and certified administrator of the ETA (Electronic Technicians Association International) exam program. He has been an Advanced Photovoltaic Systems, Residential Wiring and Green Construction Professor, as well as Dept. Chair, at Sierra College in Rocklin, CA, and an Advanced Energy Adjunct Professor at American River College in Sacramento, CA. Steve’s students have tested with one of the highest pass rates in the nation on the NABCEP PV Associate Exam (formerly called the Entry Level Exam) for 7 years in a row. Steve holds a CA State General and Electrical Contactors License and a Bachelor of Science Degree in Business Administration from San Jose State University. Steve has served on the Board of Directors for the nation's largest non-profit solar installer, Grid Alternatives, and currently serves as the Training Officer for their North Valley office. Grid is an outstanding community organization that provides solar at no cost for low-income communities, while providing hands-on training for the next generation of solar professionals. As an entrepreneur and professional marketer, using his powerful image and vision based marketing strategy techniques, Steve has owned and/or helped start dozens of businesses over the years including 3 software companies and 3 advertising/pr firms. How to Start a Business - The Right Way! Copyright © 2010-2019 Steve Geiger, solarprofessor.info, energyinstructor.com/.info. All Rights Reserved.